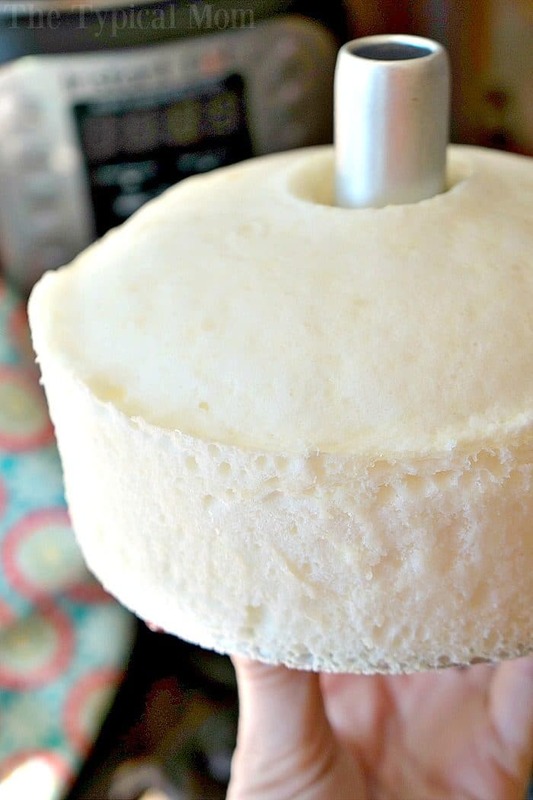 This is how to make Instant Pot angel food cake! Fluffy fat free cake right in your pressure cooker that tastes amazing! You have got to try this for dessert this week, it will be a huge hit at your house for sure. I have made many Instant Pot dessert recipes before but I must say this was the easiest and brought back a lot of memories too. This is what you’ll need and how to make Instant Pot angel food cake! Doesn’t this just look amazing?? My favorite dessert of all time. See how fluffy it is! It actually took me two tries to get the timing right but I knew I could do it. I started making just meals in my Instant Pot when I got it but soon I bought a 6″ bundt pan and made this amazing caramel apple pecan Instant Pot coffee cake and then the idea hit me….I could make just about anything in it if I had the correct pans! So I gave this Instant Pot angel food cake a whirl and the second time it came out just like it does in the oven except for browning on the top…which really doesn’t do anything for the taste. I warmed a little raspberry jam and drizzled it on top for color and it added a lot of amazing flavor to this fat free cake too. One box will make 2 Instant Pot angel food cakes so if you just want one follow the recipe below. You can see here how the middle section of your Instant Pot angel food cake just lifts off the sides once you loosen it and then you loosen the bottom where it is setting on the pan and gently turn it over on to your fingers. Then it should slide off without having to use non stick spray. Then gently place it on a plate and enjoy. 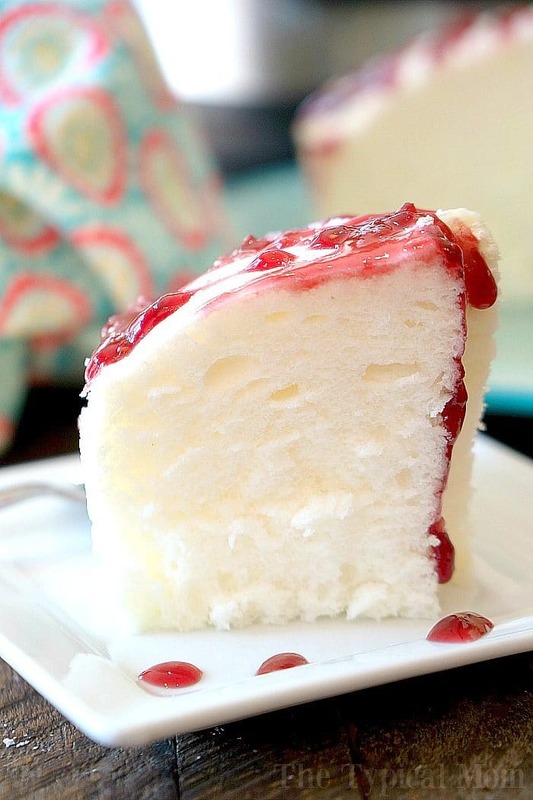 Here are a few other angel food cake recipes to enjoy! 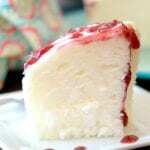 I also have a big list of angel food cake mix recipes you can try too! 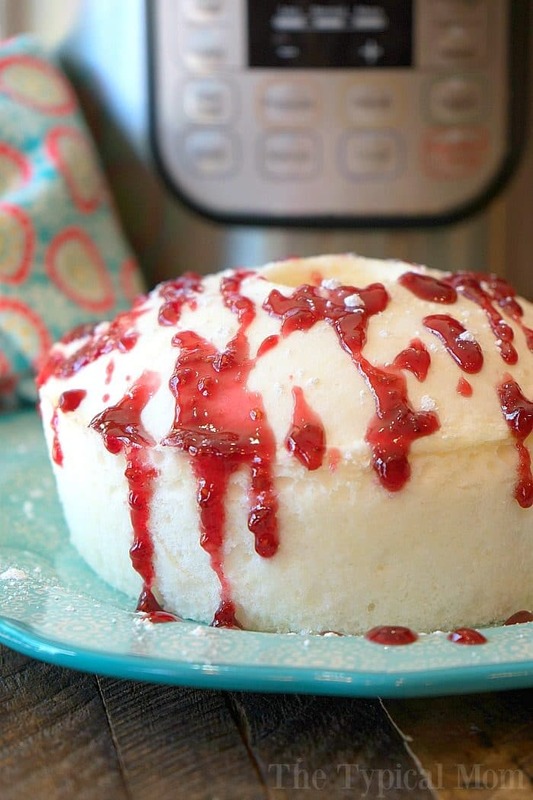 This is how to make Instant Pot angel food cake! Fluffy fat free cake right in your pressure cooker that tastes amazing! You have got to try it for dessert. Use half of your angel food cake mix box which is 1.5 cups. Put into a bowl. Combine cake mix with 1/2 c water and 1/8 c water. (I list them separately because most people don't have an 1/8 c measuring cup so just use your 1/4 c and fill half way along with your 1/2 c water. Use a mixer to mix water and angel food cake mix for about a minute on high or until it starts to fluff up like meringue. Do NOT grease your pan. The non stick pan is enough for it to not adhere and it allows the cake to "creep up" as it rises. Spoon the mixture into your 7" angel food cake pan and cover with tinfoil. Put a trivet or a small glass bowl at the bottom of your Instant Pot or pressure cooker with about 1.5 c of water surrounding it so it can steam your cake. Place your cake on your trivet inside the Instant Pot and close your lid and steam valve. Set to manual, pressure, high, for 27 minutes. Do a slow release (move steam valve slightly so steam comes out very slowly). Lift lid off quickly so the water inside doesn't cover your foil. Carefully lift your pan out and set on a cooling rack. Use a knife to loosen cake from pan on the sides of the pan. Push bottom gently and pull up on middle metal piece of pan to lift out. Use knife to loosen cake from bottom rim and a bit on the middle stem of the pan so it slides off. Put on plate and enjoy or add a bit of melted raspberry jam to the top....that is delicious too. 1 angel food cake mix box makes 2 Instant Pot angel food cakes. I never saw your answer about the 2 packets in box. One is egg white mixture and other is cake mix. Do I use 1/2 of each package? I am wondering the same thing. I scrolled though comments and I didn’t see an answer. Use the egg packet or not?? The boxes here don’t have that but yes you’d need to divide it equally amongst the amount of powder in the box. So maybe mix packet with dry ingredients in box and then measure out what you need to make this IP cake. This is amazing! Comes out super fluffy and delicious! This is genius! I love angel food cake and I LOVE my Instant Pot! Match made in heaven! Turns out perfect every time. I love angel food cake. This looks so good! I never would have thought that you could make an angel food cake in an instapot! I must try this! Just made this and it was SO good!! Perfect little cake for two. Thank you for making it so simple so that an IP newbie like me could do it! Delicious!! I followed your receipt but my cake didn’t rise. It was perfectly flat and about 2inches in height. Either your seal valve wasn’t tight enough, foil wasn’t tight enough, or cake mix may be expired. My thoughts. Looks good. I just viewed the video on the IP Community FB page. I used the link to get here. Just wanted you to be aware that above the recipe where it says watch the video, there’s nothing there. Thanks for letting me know, added it again. Yes it is there, I checked. You may have an ad blocker that isn’t showing it to you for that reason. Can I just use a regular 8″ cake pin or a cheese cake pan instead? Regular angel food cake can be made in a loaf pan so probably. It would be worth 1/2 cake mix & water to try it out! I made this cake and is just like one in the oven. Perfect size for a small group or two people for three to four days. Followed everything and perfect . I did tipmy pan on a bottle to cool like in an oven one. My husband loved it, topped with a fruit sauce. My cake mix in a box came with an egg white packet. Is that part of the 1.5 cups? I was wondering the same thing! What did you end up doing? I have the same question. Has anyone cooked it with the two packs in an instant pot? What do you mean by two packs?? 1/8 cup is also 2 tbsp. So 1/2 cup + 2tbsp would also work for your recipe wording. I am new to instant pot and most of your recipes look awesome! I would like to make this cake for my husband but wondered how tightly do you put the foil? I wrap it pretty well so water doesn’t get on the cake. I use foil so that doesn’t happen. I used an 8″ angel food cake pan, half the batter, covered, 27 minutes on high pressure, let it NPR. It overflowed, and then went flat. Could altitude have an effect on this? I am at 8,000. My Instant Pot does not have a Manual setting. If I just set it on high pressure, will the timing be the same? what is a instant pot I do not have a pressure cooker anymore..
It’s an electric pressure cooker that also has other functions. It’s extremely useful and can make cooking much easier and faster. It doesn’t do everything, but it can do many things and save you money. As long as you get the right model, you can make a gallon of yogurt for the cost of a gallon of milk and it’s super easy. People have complicated ways of using it, but if you stick to the easier ways, you’ll save a lot of time. Also, you can take a pound of dried beans and have them cooked without soaking in maybe an hour. It takes about 30 minutes once the pot comes to pressure, and the length of time depends on the amount of food (mostly water in the case of beans) in the InstantPot. You can cook perfect hard boiled eggs in a few minutes without having to watch the pot or use a lot of water. They are steamed, actually. You can cook pasta in one pot with the sauce. You can cook chicken and noodles in 5 minutes flat plus the time to come to pressure. I have not personally succeeded in making bread or cake in my InstantPot without it becoming heavy, but many have succeeded in making cheesecake well in it. I use mine for sous vide on Keep Warm after putting hot water in the pan. Works very well. It’s much safer than the old stove top pressure cookers. You do have a few safety rules that you must follow, but they are easy. You can only fill it so much, for example. Also, you have to use water to cook. You don’t want to cook cheese sauce or it will burn but you can make the noodles in it without training and then add milk and cheese in a specific way to make the most wonderful macaroni and cheese. It will really change the way you cook, and you can keep the steam out of your kitchen for the most part if you turn it off before things are completely cooked and let the remaining heat finish cooking them and then open it only after the pressure is gone. It’s a wonderful appliance. It’s on sale often if you look for it. Probably around the holidays and sometimes at other times, such as Amazon Prime Day. Just know the difference between the types because newer models do more and some models let you choose any temperature while others don’t. I have the 6-quart models, 2 of them though it’s so fast that I should have just gotten an extra pan and lid instead. Could you do this in mason jars? I made this in my 6 inch bundt pan. I had so much batter that there was no way to put it all in this pan. I filled it 3/4 of the way up and then let the rest of the batter sit that half hour to make another one after the first cake was done. The first cake rose up to the top of the aluminum foil so I may have put too much batter in my pan. The second cake turned out flat. My question is, is there that much difference between a 7 inch tube pan and my 6 inch bundt pan? If I make it again, I may cut this recipe in half. I do not use a bundt pan for this, I use the angel food cake pan that you see in the recipe and there is a link to the one I use in the post as well. There is a difference in pans. Where can I buy the angel food pan for the Instant pot? I have looked on Amazon and ebay, and googled it, and can’t find the small one anywhere. It’s Betty Crocker Angel Food Cake Mix!! There is a link in the post here for the pan that I use. Does the 7″ angel food cake pan fit in a 6qt Instant Pot? Yes, I have the 6qt and the 7″ link for the pan above is the one I have and fits well. I am confused about the 1/2 cup + 1/8 cup note for the water. That type of notation would make me think that you are using dry style measuring cups vs. a liquid measuring cup (like the glass one shown adding water to the Instant Pot). You will get more consistent results using a liquid measuring cup. Dry cups must be filled to the exact top to get the full measure. I can’t do that without spilling liquid. You must be more steady than I. I would just measure out 5/8 of cup in a liquid measuring cup. I just bought 4.5″ pans. Any ideas of how long to cook these? I’ve only used the pan linked in this recipe so I don’t know timing for others. I just did an experiment with the 4.5″ non-stick angel food cake pans. I used 1/2 of the recipe above and cooked on high pressure for 15 minutes. My cake overflowed, but was cooked through. Next time I’ll use 1/3 of the recipe listed and try for 12 minutes. I also forgot to cover mine with aluminum foil–good thing with the overflow I had! Hope this helps. Oops! Forgot to mention that I did mine in the 3 quart mini Instant Pot. Oh good to know, thanks for the info! I don’t know if I missed it but several people have asked about the pan. Do you need to purchase a special pan? Please answer. So annoying not to know. It looks really good and I want to make a couple. I’m replying to my own comment! Figured out the pan problem. Can’t believe I missed it. Sorry! Do you need to purchase a angel food pan that is special for this? So how did you do this? I’m new at this . Did you buy a special spring form to use in this pot? If you use much more than half it will overflow. The pan is small and I wouldn’t fill more than 3/4 of the way full because it will rise quite a bit. This recipe will make 1 cake, or use entire cake mix box and cook twice to make 2 angel food cakes. I have pans like these, will they work or are these special? Are you using a dry measuring cup for the water????? Do you need to turn the pan upside down when cooling the cake like when you bake it in the oven? It is the recommended way to cool angel food cake. This sounds neat, is there a recipe made without the box cake mix, I.e. from scratch? Living abroad and not finding cake mixes in a box. Thanks! I’m guessing you could just half the recipe for a homemade, from scratch angel food cake? Do you have to grease the pan first? I have the red bundt pan. No, as long as your pan is non stick to begin with it is best to not grease it. I see lots of non stick angel food pans on Amazon, but both the ones you link to are just aluminum, not non stick. I prefer not having a non stick, so those work great for me.